Life is changing in Sri Lanka as the trappings of modern life intrude after years of war. "Jaffna connected!," screams a mobile phone company billboard on a main road in this war-weary town in northern Sri Lanka. For once, this doesn't sound like advertising spiel. Two years into peace talks and a ceasefire with the Sri Lankan government, the leafy green peninsula is getting connected with the rest of the world and looking up. The scars of a bloody two-decade-long civil war are still there - buildings destroyed and pockmarked by bullets, traumatised orphans, struggling war widows and refugees, and runaway inflation. Doubts remain about the political future of Jaffna's majority Tamil residents. The peninsula, dotted with lagoons, remains in charge of the army, which took control in 1995. 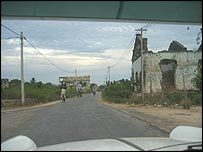 Jaffna still looks like a garrison town with soldiers in olive-green sandbag bunkers and whizzing past in Toyota pick-ups, trucks, motorcycles and trishaws. Petty crime has shot up due to lack of jobs - burglaries are rife. A dole culture has kicked in - free government rations for the war-affected people are often misused. But Jaffna is clearly coming out of the shadow of the war. A six-year ban on domestic flights was lifted and a private operator operates two flights a day to the Palaly airfield. This is a wobbly jungle airstrip on which dogs languidly stray and passengers wait in the shade of a 50-seater plane for a bone-rattling bus ride to town. The passengers include traders, mine clearance experts, doctors and teary-eyed video camera-wielding expatriates returning home for a glimpse of their lost homeland. Half of Jaffna's pre-war population of one million fled the country during the conflict. Its two ports have opened to international shipping. Colombo's economic embargo on the peninsula has been lifted, and the key highway linking Jaffna to the rest of Sri Lanka has been re-opened. An executive of a mobile phone company says that that they've signed up 15,000 subscribers in the peninsula in the past two years. Refugees in the town try hard to eke out an existence fishing and running makeshift motorcycle workshops in dilapidated, abandoned hovels. But war has made Jaffna a curious mix of the modern and archaic. The town reeks of kerosene, thanks to its ingenious people. The souped-up Morris, Peugeot and Fiat taxis and Indian trishaws merrily run on a potent and inexpensive mixture of kerosene and petrol. The derelict, bombed-out gas stations even have separate dispensers for kerosene and petrol. My driver S Ramachandran drives up his white 55-year-old Morris Oxford - which he bought in Colombo for 250,000 rupees ($2,700) - first to the kerosene dispenser and asks for an initial fill. Then he drives up to the petrol dispenser and orders it in a ratio he works out quickly. Ramachandran says he's rigged his engine to fire up on a kerosene-petrol mix simply because a litre of kerosene costs less than half of a litre of petrol. "Kerosene doesn't harm the engine," Mr Ramachandran confidently asserts. "Half the things in this town run on kerosene." 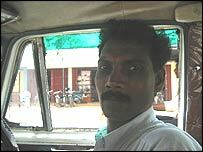 The taxis may be vintage, but the FM radio on their slick Japanese car stereos belt out the latest gangsta and Tamil rap. Tamil history is lost - how do you identify a nation and its people without any history? I even heard a foot-tapping Tamil version of Bob Marley's Buffalo Soldier. Driving on its pot-holed roads past red-tiled concrete buildings fenced with elegant fan-like fronds, one senses a town in a hurry to catch up with the lost times. The jewellery shops, pawnbrokers, and colourful clothes shops with the slightly grisly amputated mannequins do brisk business. They remind me, in a strange way, of the mines which still remain in the peninsula. There's even a detailed mine map at the local bus station for drivers and commuters alike. Innovation comes into play when it comes to providing entertainment to a town in dire need of it. Most of the town's cinema halls were destroyed during the war. They included the Regal, the only one that showed English movies and boasted a small bar and a video game arcade. But cheaper 100-seater mini-cinemas or makeshift video projection "halls" have taken their place charging 30 rupees (30 cents) a seat for new Tamil, Bollywood and Hollywood offerings. There are football games going on at the refurbished stadium, ice cream vans trundle all over the town, there's even a tidy new supermarket. 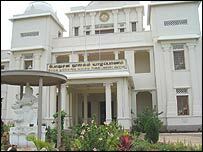 Young students are mad about management courses - a fifth of Jaffna University's annual intake of 1,500 students study management. "Most young people here want to study management. That's the best way to get a job," says vice chancellor S Mohandas. The reopening of a modern library points to the revival of Jaffna. Nearly 100,000 priceless books and Tamil palm leaf manuscripts were destroyed when the old library went up in flames in 1981 - allegedly torched by government-backed thugs. Rebuilt with foreign aid and replenished with donations, the new library opened to the public last month. "There are no old books here. This is a contemporary library with no historical value. 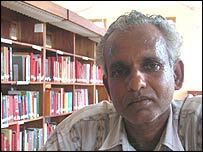 But it's still a new beginning," says librarian S Thanabalasingha. Readers like Manickam Chandrasegaram miss the old library. "Tamil history is lost. How do you identify a nation and its people without any history? I feel very sad about the loss," he says. The general feeling is life would be better if the soldiers packed up their bags and went home. "I lost one house and my farm in the war. The other house has been occupied by the soldiers. I live in a rented place now," he says. "Last month," says Mr Thanabalasingha, "the soldiers told me that they will vacate our houses after a permanent solution." When that will happen is anybody's guess. But, in Jaffna, people will continue to pick up the pieces and get on with their lives.